Click here to get more information, full transcripts, and watch videos. Cybercrimes are estimated to be costing American businesses over half a billion dollars a year and with security breaches regularly threatening the personal and financial information of broad swaths of the American public, the problem seems to be getting worse. 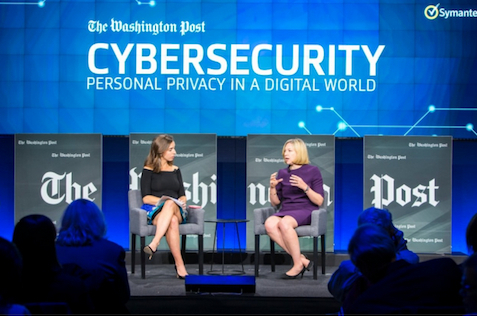 On November 8, 2017, The Washington Post brought together business executives, leading cybersecurity experts, privacy advocates and others to discuss detection and prevention strategies for individuals and corporations. The experts examined the current and future cyber threat landscape and the solutions that could help consumers cope with this urgent problem. Jeanette Manfra, Assistant Secretary for the Office of Cybersecurity and Communications at the Department of Homeland Security, discussed efforts that government, Congress and private industry are undertaking to more seamlessly partner around cybersecurity issues. Two leading experts in the field -- Sam Curry, the Chief Product and Security Officer at Cybereason, and Rob Knake, a Senior Fellow at the Council on Foreign Relations -- offered suggestions for how businesses and large organizations can better protect against data breaches, including shoring up two of the most basic cyber hygiene issues: Weak passwords and stolen credentials. Dante Disparte, Founder and CEO of Risk Cooperative; Mischel Kwon, Founder and CEO of MKACyber and Eva Velasquez, President and CEO of the Identity Theft Resource Center, discussed best practices for consumers to protect their personal and financial information.